Nintendo Pocket Football Club is a management simulation game based around the sport of soccer, developed by ParityBit and released for Nintendo 3DS. The game is a follow-up to and reimagining of the Game Boy Advance title Calciobit The game was originally released in Japan in July 2012 at retail, and later on the Nintendo eShop in January 2013. 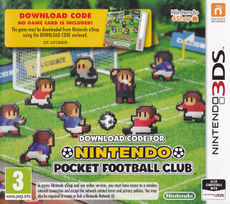 Nintendo Pocket Football Club was later released in Europe in April 2014; between launch and May 1, 2014, the game was available at a discount price. In January 2015, a physical box containing a download code for the game was released at retail. Lead your team to fame and glory! The unique, pick-up-and-play football management sim. Your Mii – the gaffer! Set the team up as you want it! Play online against rivals from all over Europe! Online match results and rankings are calculated automatically. Head up your own football team and shoot for the top! Nintendo Pocket Football Club puts you in the manager’s seat at your very own football club, only on Nintendo eShop on Nintendo 3DS. Can you keep the crowds chanting and guide your pint-sized players from the lower leagues to the wonders of the world stage? As manager, train up your players and choose your tactics wisely to make the most of their abilities. Once you’re satisfied, send your team forth and watch your decisions play out in matches packed with action – but don’t be afraid to alter your approach if it all starts to unravel before your eyes. Delve deep and show plenty of skill on the sidelines and you could lead them all the way to the glorious treble of the Pro League 1, the Federation Cup and the European Challenge Cup. With enough work, you could even bring the World Club Classic back home! Win, lose or draw, you’ll earn Training Cards during each match. Between games, use Training Cards to improve your players’ abilities: teach a defender how to tackle, help a midfielder perfect their passes or build a striker’s morale before a crucial match with a relaxing spa treatment. Play your cards right by selecting the right training combination and you could come up with a special technique that scores your player an even bigger boost! Run your club just the way you want it. Don’t like your kit or emblem? Dye them a new shade and display your new colours with pride. Re-name your team, and even each individual player, to suit you. Check out prospective signings in the transfer market if your team’s lacking in certain areas, then create completely custom formations to focus on your squad’s strengths. You’re the boss in Nintendo Pocket Football Club, only on Nintendo eShop on Nintendo 3DS! Completely customise your team, from kit colour and emblem to individual player names! Nintendo Pocket Football Club was developed over the course of six years. The game's development began on the Nintendo DS; because the original title had been released late in the Game Boy Advance's life cycle (despite discussions of moving the game to the Nintendo DS), the team decided that it would be best to remake the game for the newer hardware. As the game's development took longer than expected, however, development then shifted to the Nintendo 3DS platform. When developing the new version, creator Hiroyuki Sonobe was intent on not adding more further and more complex mechanics to the gameplay as most sequels would have. Sonobe also developed the game to minimize the amount of player interaction while maintaining enough to keep players engaged. The game's network functionality was the one aspect he spent the most time working on. For the game's European release, Nintendo Pocket Football Club received more mixed reviews from critics, largely citing the game's inactivity and simplicity compared to other football simulation games. Chris Schilling of Eurogamer gave the game a 7 out of 10, stating that, "Nintendo Pocket Football Club offers an even more reductive approach - and for many, it might just take away too much," and that overall, "It might take away much of what makes a truly authentic sim, but in doing so it gives back plenty besides." Edge rated the game a 5 out of 10, claiming that, "The problem is that looking makes up the great majority of what the game asks you to do." In the end, the reviewer stated that, "[...]it’s a cheap thrill, a shallow way to connect input with outcome that doesn’t, in the end, compensate for Pocket Football Club’s lack of responsiveness elsewhere." Players can purchase downloadable content in the form of additional teams to play against. The content was released on April 23, 2014, in two categories: "Focused Training Teams" and "Challenge Teams". Certain teams can only be played against after completing a certain number of seasons. Aegis AFC – Focuses on helping the team's defense. Raiders City – Focuses on helping the team's offense. Tough Tutors – Focuses on raising the team's stamina. Finesse FC – Focuses on helping the team with ball control. Goalie Gurus – Focuses on improving the team goalie's goalkeeping. Strike Team – Focuses on helping the team score goals. Football Uni – A team that starts with no skill but improves as the match continues. Galactic V – An alien team that can use various abilities when playing. Copy Cats FC – A team consisting entirely of clones of one of the team's players. ↑ 1.0 1.1 NoE: ‘Tune up your team with Nintendo Pocket Football Club add-on content!’ NintendObserver (April 23, 2014). Retrieved May 5, 2017. ↑ 2.0 2.1 2.2 Iwata Asks | 5. Six Years of Work | Iwata Asks: Nintendo Pocket Football Club. Nintendo.co.uk. Retrieved May 5, 2017. ↑ 3.0 3.1 3.2 Iwata Asks | 4. Taking on Tough Opponents | Iwata Asks: Nintendo Pocket Football Club. Nintendo.co.uk. Retrieved May 5, 2017. ↑ 4.0 4.1 Famitsu Review Scores: Issue 1231. Gematsu (July 3, 2012). Retrieved May 5, 2017. This page was last edited on 12 August 2017, at 16:48.